What if you could send your email into the future? ReplyLater is an easy email reminder service. Simply send an email to one of our special addresses ending in @replylater.com. Look at How Many Ways You Can Send! To learn more possibilities, check out the Manual. Try sending an email 1 minute into the future: email 1minute@replylater.com right now. Alice wants to remember Bob's birthday. She sets a reminder to herself for December 1st. Before ReplyLater, Alice had trouble remembering birthdays. Alice wants to be sure to remember Bob's birthday, so she send an email to december@replylater.com. Then on December 1st, at the stroke of midnight, she receives a reply to that email (with the same subject) that reminds her that Bob's birthday is coming up soon. Alice emails Bob and sets a reminder for herself. Alice will be reminded about this email on Thursday. ReplyLater also makes Alice look like a follow up master. Alice emails Bob about the TPS reports on Monday, but Bob isn't that great about getting back to her. Normally Alice has to devise some system to remind herself to check up on Bob later in the week. 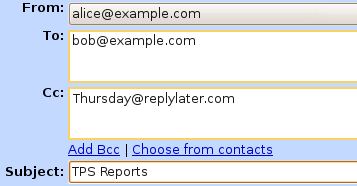 Now with ReplyLater, Alice just sends the email to thursday@replylater.com. Then Alice stores her email conversation away knowing that she will be reminded on Thursday about it. On Thursday, Alice gets a reply email from thursday@replylater.com that brings the conversation back to her inbox and reminds her to follow up with Bob. Bob gets back to her, and the TPS report is finished on time!